Certainty principles can be leveraged to significantly improve your inventory optimization and customer service levels: A simple approach to isolating uncertainty. Demand or supply variability continues to be the major factor in supply chain planning accuracy. Optimization models often treat each optimization exercise as a "green field," and do not anchor their analytics around what we call "certainty principles." In other words, there are known things about a business; they are certainties. They can be used in optimization models to improve analysis, help control spending and improve working capital, and maintain service levels. Often, when running optimization exercises, all data elements are considered variables; thus, arriving at an economic model is challenging. Scenario planning for a variety of factors can do "what if's" on each variable, and this is often done. But to arrive at the lowest cost or the fastest so-called "optimal" plan, certainty has to be part of the model. We can arrive at that by spending a little time on what we do know with some certainty, so we can eliminate all but the few uncertainties. Isolating this uncertainty allows us to derive a reasonable plan of action. Noah had a huge logistics task assigned to him, with a life or death outcome for the future of the world. Getting the model right was critical. So, Noah had some certainty principles: he knew what demand was. (One myth to clear up here has to do with the number of animals on board. General knowledge says that there were two of each animal, but according to Genesis, there were more "...than 7 pairs of the pure, 2 pairs of impure," not 2 of each). He also knew how large his space was. The <?xml:namespace prefix = st1 ns = "urn:schemas-microsoft-com:office:smarttags" />Ark was 300 cubits in width, 50 cubits in height, and 30 cubits deep (by modern estimates, just shy of 600 rail cars). He certainly knew how many days it was going to rain, but did he really know how many days of food to store? Of note, in all the Bible stories of the world, nobody addresses this critical planning element: How much food? (We consulted a Torah teacher and scholar on this topic.) Genesis 6: line 21, "...for your part, take everything that is eaten for you and for them." So, Noah's task was then to "fill the warehouse." Ultimately, the food takes up much more space than the animals. However, by various mathematical accounts there is actually plenty of room for food. But how much food? This is the critical final question. Most optimization models try to determine a minimum and maximum, and then model based on the cost vs. service tradeoffs. In retail or manufacturing, cost is a huge factor, but in other supply chains, such as healthcare, cost is sacrificed to save lives. 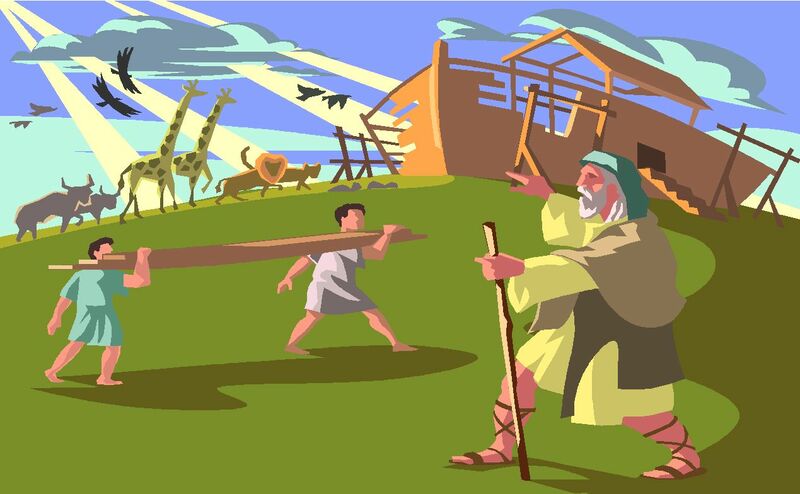 As it turns out, Noah knew at least the minimum "safety stock needed." Genesis 7: verse 4, "...in 7 days time I will make it rain for 40 days." So he has his minimum of 40 days of food required. This leads to our one uncertainty. If we care about cost, we only want the minimum plus some risk factor amount of food. Because once it stops raining, Noah still needs the "waters to recede" before resuming life on dry land. Cost plays a factor in any max inventory calculation. Noah has the space, and he's not concerned about working capital, but you might be. So this leads to the one uncertainty to focus on: the max inventory and the one "information point" or business practice that businesses can focus on to dampen the impact of that max inventory. Modern planners need to focus more on turns, rather than cost. If I can consume at a reasonable economic rate (and have good payment terms from customers), a higher level of inventory can be tolerated. In addition, if my goal is to plan for upside risks, I do want to model for a higher level of inventory. Conclusions: What Noah knew that you don't. In our little thought experiment, Noah was provided almost all the data he needed for his optimization model: he had a demanding "Customer" with a fairly explicit forecast. He was not concerned about the economic model, a great advantage over modern planners who have to be concerned about cost. Today's fast-paced businesses are not likely to be provided this data. In teaching supply chain, it is interesting that when given this exercise, how few students are able to drill down and eliminate all the certainties to find the one uncertainty principle. Today, sophisticated weather models help planners account for the effects of weather in their risk management plans. No doubt we want to keep inventories at their minimum, but with focus on working capital and turn rates, a model can tolerate a larger inventory level and still be highly profitable. You might want to do that, considering all the rain, floods, and earthquakes we are experiencing these days!